At 6:05am on Monday 5 November 2018, one of Australia’s most passionate and prolific cycling safety advocates was hit from behind while enjoying a morning ride near his Sunshine Coast home. Pronounced dead at the scene, Cameron Frewer left behind a loving wife, three heartbroken children, and a cycling safety, equality and awareness legacy that spanned a decade and reached countless numbers of people. Making the most of technology and the unlimited communication potential of social media, Frewer made it his mission to record his rides, show others exactly what was going on out there, and illustrate to all Australians that vulnerable road users needed to be acknowledged and respected. In addition to this, and in what many now consider to be his most important and potentially long-standing work, Frewer frequently lodged close pass complaints with officers at his local police station. To Frewer’s growing frustration, he felt the vast majority of these complaints were not being taken seriously. This was a point his heartbroken and grieving wife Catherine Frewer elaborated upon when she recently spoke with Bicycling Australia. I’m now Cameron’s voice. I’m hoping Cameron’s death is going to push this to the brink and he has made a difference. 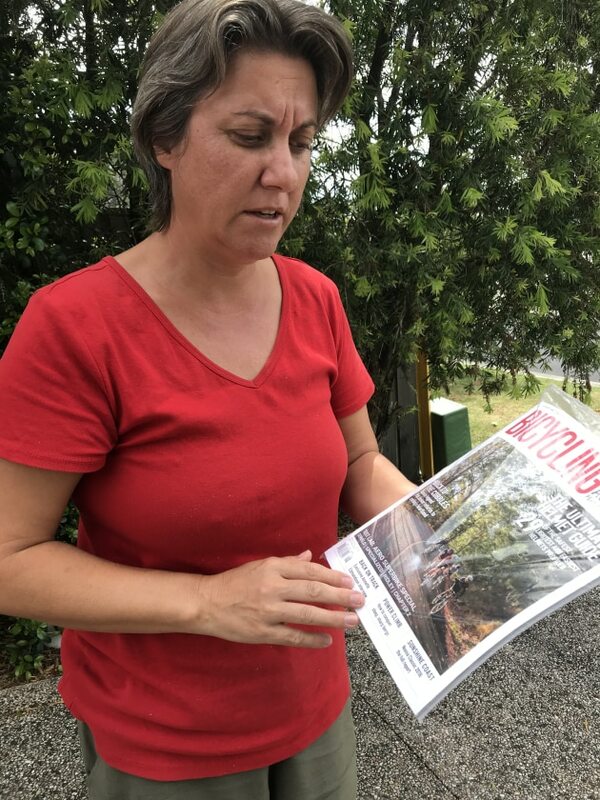 Catherine with Cameron’s copy of Bicycling Australia, the edition arriving soon after his tragic death. Catherine said Cameron simply wanted motorists and cyclists to harmoniously share the road, whatever the road, and for police to take his reports and complaints seriously and follow the law. Through tears, Catherine Frewer said, “You never think you’ll be in this position, especially with three children. “It’s very hard to get my head around what has happened,” she told us. “But I’m a mum, and the children need me to to be strong and not break down. Catherine remains determined that her husband will continue to make a difference and said her mission from now is to honour and keep his name, spirit and legacy alive. “I’m going to keep his fight going,” she said. “More needs to be done before this happens to someone else. The more we push now, the better the future will be for all riders. I’m going to spread his name out like wildfire. It makes me feel very honoured that I was Cameron’s wife and I now have the responsibility to carry this on for him. Anne Savage was a professional colleague, good friend and close confidant of Cameron Frewer. The CEO of state advocacy group Bicycle Queensland, Ms Savage described Frewer as “a good sport and a fair-minded man”. 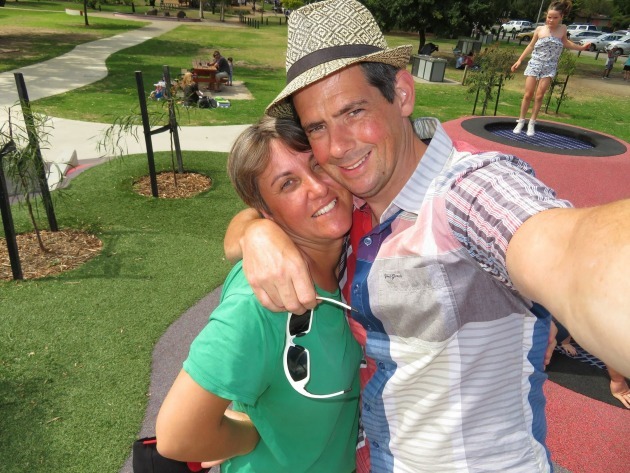 “He would have done anything for his wife and three kids,” she told Bicycling Australia. “They moved to Queensland in April 2017 to give the kids the the best possible start in life – Cam loved the outdoors. Cameron knew the law, she said, and he knew he had a right to be on the road. Ms Savage said the Queensland policing system failed him many times. “He felt taunted and ridiculed, at times. He didn’t let them tear him down, despite feeling deeply disparaged and dismayed. Cameron Frewer was laid to rest at a private family ceremony in Caloundra, Queensland. Shortly after the sombre occasion hundreds of friends, supporters and fellow cyclists gathered together in colourful clothing and cycling kit for a public memorial service followed by a wake. Cameron Frewer’s tragic story generated local, state and nationwide support, sympathy and mainstream media attention. Since his death it has become abundantly clear that Cameron’s quest for equality, safety and harmony among all road users has only just begun. Rest In Peace Cameron Frewer. This Article First Appeared In The January/ February Edition Of Bicycling Australia Magazine.